Is the Mercedes-Benz A45 AMG hot hatch a supercar slayer? A hot hatchback with a 2.0-litre engine? Not exactly novel. Actually, it's a classic recipe for four-wheeled fun. But what's this? 355bhp. Zero to 62mph in 4.6 seconds. All-wheel drive. And a 'Benz badge on the bonnet. You'd better buckle up because the new Mercedes-Benz A45 AMG is unlike any hot hatch you've ever driven. Thought electric and hybrid ecocars with a free set of sandals for the family were all the rage? Then reboot your brain. 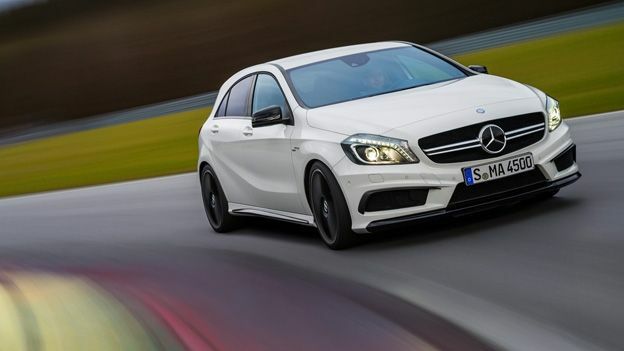 The Mercedes-Benz A45 AMG is totemic of a performance car industry in rude health. But here's the funny bit. The techno tricks cooked up by the latest generation of eco-warriors has helped Mercedes turn the slick little A-Class hatchback into a bona fide bad boy. Much of that effort involved squeezing reasonable grunt out of very small engines. Apply that philosophy to a healthy 2.0-lump, add four-wheel drive and a computer-controlled paddle-shift gearbox and the result is a sensible family runabout that can slay supercars. Oh and that downsized engine tech translates into a combined mpg over 40mpg and near 50mpg on the cruise, too. Incredible. Of course, this is also just an A-Class. But that's a good thing because it means the A45 AMG comes with all the refinements and in-car tech offered by Mercedes' smallest model. And it's packaged in a practical and family-friendly five-door shell. On paper, it's the performance car for every reason and all four seasons. We've touched on the mentalist turbo engine, the four-wheel drive and robo-controlled 7-speed gearbox. That's just the go-faster kit. Brace yourself for a barrage of actively controlled A-Class safety extras. There's Attention Assist, Collision Prevention Assist, Lane-Keeping Assist, Distronic Cruise Control, a blind spot warning system and even headlights that peer round corners for you. A rear camera and an active park-assist feature also help take sting out of parking dings. Inside, there's the latest Mercedes COMAND system with a high-def screen and full iPhone integration. Hot hatch as supercar killer is one of those clichés that sounds catchy but doesn't hold up in the real world. Until now. Believe us when we say that only the very latest and greatest supercars could keep up with this most mental of Mercedes. Even then, you'd better be Jenson Button or one of his breed. That's because on real roads, the combination of over 350bhp, all-wheel drive and a paddle-shift gearbox in compact package is devastatingly effective. Just as important, the A45 AMG fizzes with feel. It's actually more fun than BMW's rear-drive M135i. So much for the ultimate driving machine. The bog-standard Mercedes A-Class is an impressive family hatchback that's just a little slicker and sportier than the Audi A3 and BMW 1 Series competition. But this new AMG model is a monster. Bonkers quick, bags of fun and bursting with tech, it's one of the very best all rounders you can currently buy.